So, more than two months have passed since my last blog and what have I been doing? Readjusting to life in the UK after being in Australia and Hong Kong, wondering what comes next and finding no answers. And then this morning I rose at 5 a.m. to meditate. In the deep stillness of early morning I finally realised that this 'not knowing' (also known as floundering) is as much a part of the creative process as anything else. I'm unsure whether to repeat what I've done in the past or whether to sharpen up my receptive faculties and see what arises. I've decided on the latter and will wait for as long as it takes. The stones project has never been about speed - it moves with the velocity of a snail and now is proving to be no exception. Floundering is only uncomfortable when I'm pressing myself to move forward and expecting something to happen. Waiting for the next instructive dream, or an idea that rockets me into action. But there is no idea for now and no dreaming, apart from one small glimmer of an A-5 book of stones and stories. Beckett had a lot to say about waiting. Various railway companies also have a lot of announcements to make about waiting. There are waiting rooms and waiting times, people who wait on tables in restuarants, waiters and waitresses. Ladies in waiting. Artists in waiting. I am waiting on something and have no idea when it will arrive. Meanwhile then, I am returning to play, something that has been almost edited out of my life over the past couple of months. I'm painting again, writing little things of no consequence, staring at blank walls and dreaming. Lying in hot baths until I'm wrinkled like a prune. The only thing of note, at least the most interesting thing of note, was the liberation of a lobster on the 20th December. Since then, lobsters have begun to crop up all over the place. I'm not sure what this signifies - although it's probably something fishy and profound - so if you have any ideas please let me know. Until the next blog, I wish you all a magical new year. Tomorrow I leave for Australia. My bag is nearly packed and I've still a million things to do. Including a swim at the Quay and a walk through the Vale. I can't go without saying goodbye to the ocean and the oak tree that's been a constant companion to me over the past four years. A grand beast of a tree, the north side of its trunk covered in moss and ferns, verdant limbs spiralling up into the sky. The stone is swaddled in bubble wrap and ready to go. The funny thing with leaving is that I've been posting parts of myself to Australia for more than a month now. Sending little imaginings ahead, planting the idea of myself and the migrating stone in Sydney. It's good to do this, it's preparation, a good tilling of the soil I'm about to set foot upon. I'll be gone for a month. Which feels like a very long time. Still, this stone has been waiting patiently for three years already to be taken to its new home and the time is now good and right. On Saturday I visited Rough Tor. Rough Tor is a remarkable place just on the edge of Bodmin Moor near to Camelford. It is a high tor and there are the most extraordinary nature sculptures on its peak: huge slabs of granite that have been chiselled by ice and wind over many centuries. The slabs are laid on top of each other in places, making it look as if Andy Goldsworthy has been there beavering away. For me, Rough Tor is a stone kingdom. There are so many stones - balancing stones, tumbling stones, broken stones - that to be human in this place is to be in the minority. There are wild horses and cows and sheep and the wind tumbles around the place like a feverish duster - always sweeping things away, making them fresh, never letting anything settle for too long. Whilst I was there I was particularly struck by the way in which stones rise up and out of the earth. At the same time I was pondering why so many people take stones as souvenirs - and then these two things become obviously connected. Souvenir means to rise from below - and I think that this is what stones do. Not only literally, but also metaphorically because they remind us of what can rise up from within us. The intuitive, instinctive parts of our own natures. That which we know without needing to be taught. Stones takes us back to our primordial selves: they remind us of who we are, who we were from the moment we were born. And who we will be when we die. Perhaps even after we have died. Something so basic and so essential that for a moment we recognise the stone as a friend; a companion, someone who understands what is in our hearts without needing to speak of it. There's all kinds of things afoot with the stone. In fact, it appears to be taking on a life of its own. If you go to the Arvon Foundation's newsletter you'll see the stone and how it's become part of a competition where people get to say where they'd like to take it and why - and the winner will receive a writer's and artist's yearbook. Of course, I'm not suggesting that the stone set this opportunity up. It happened due to the enthousiasm of a man called Philip who works for Arvon. But nevertheless it goes to show that the stone and its migratory habits has the ability to excite people and to get them involved in some way. This was also borne out last weekend. I attended the Resurgence Summer Camp as Satish Kumar had invited me to read poems there. Miraculously the sun shone all weekend and at times shade has to be sought for comfort. Again and again people were intrigued by the migrating stones project: for some reason it taps into something very deep in our psyches, this idea of stones moving around the world. I'm not quite sure why - so if you have any insights or ideas do let me know. But there's no getting away from the fact that something is sparked in us when we think of stones or pebbles - an old memory that we can't quite grasp, perhaps a feeling in our bones that we too will be stones one day and when we are we'd like to be treated well and taken care of. Meanwhile the date for my trip to Australia draws ever nearer. Small butterflies have begun to spawn in my belly. It's a long way away and I hope I've done everything I need to do to ensure the stone gets there in one piece. I've started meeting more and more people who love Australia and I have a sneaking suspicion that I'm going to be rather blown away by the oldness of it. Who knows? I'll find out soon enough. I once did a project on the nature of time with the artist Hannah Cox. As part of this project I called my mum one day from a phone box at the top of Corn Street in Bristol and said, "Mum, what can you tell me about time?" She thought about this for a while and then said, "Well, it goes a lot faster the older you get." So I haven't blogged since summer solstice which is over two weeks ago - where did those weeks go and how did they go so quickly? Part of the answer to this question resides in a public art project I'm currently involved with called Companion Stones. It's taking place in the Peak District and is really inspiring. I'm working with artist Amanda Wray to create a companion stone for one of the stoops on the Moor. These stoops (stones) were put on the moors to guide people in the right direction: Bakewell, Derby, Sheffield, Dronfield etc. Prior to this it was very easy to get lost and if you were lost there was a high likelihood that you would starve to death. The stoops were installed in 1709 and here we are nearly 200 years later creating companions for them. Meanwhile the migrating stone is still progressing. 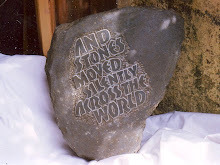 I'm in contact with Australia with regard to siting the stone and it is all starting to feel a lot more real. I'll blog again soon with further details of this and the stone's progress. Tonight I will be celebrating solstice with some friends. We will gather to eat food and read some poems by Rumi and Hafiz. The notion to do this came about when I discovered recipes for curry in the back of my Rumi's collected poems. It seemed to make perfect sense - the combination of poems and recipes. A trend that could perhaps be encouraged in contemporary poetry books? Who knows, perhaps there's a whole hungry market out there just waiting for for the poem/food fusion to happen. All we need is a mystic restuaranteur or publisher to step this way and we're off. Meanwhile, my ticket for Australia has arrived. I will be flying on the 24th of September with Virgin. The aeroplane only stops in Hong Kong for refuelling and so once I've managed to get the stone onto the plane then I know that it will arrive in Sydney. I'm excited about travelling with this next stone. It has been three years since I took the last one to the U.S.A. and I'm looking forward to reconnecting with everything stone and the mysteries that imbue stone. I'm re-reading Phil Cousineau's Art of Pilgrimage in preparation - this is a great book full of inspiring quotations. I'm also about to have some photographs taken of the stone and me with the stone which will then be posted as soon as possible. The strangest thing happens on Sunday 8th June. I'm sitting in a field at the Bovey Tracey craft fair munching my way through a salmon salad when my phone rings. It's my friend Roger. Roger who lives in Australia. What's he doing back in the UK? I think. But he's not in the UK. He's on a beach in Sydney and he and Neil were thinking of me and so they phoned. Roger said, "We keep on imagining you here Alyson. Everywhere we go, it's so easy to see you. In fact, it's as if you are already here." That's the thing with travel. A little part of you leaves days, weeks, months before you actually step onto the plane or train or road and depart. An envoy of the soul if you like. Meanwhile, on the practical front, I'm trying to speak with customs. If you dial the number that you find for customs and excise on the internet you get a hideous squeak followed by the predictably mechanical voice that tells you the number is not recognisable. Here we go, I thought, anticipating spending at least the following three hours trying to find someone to talk to about taking a stone through customs. Enter Stuart: a real, live human being who is part of the Heathrow Airport Information Team. What a star. He is friendly and extremely helpful. He assures me that a stone is not such an unusual item to take through customs (people take anchors for boats he tells me) and that I should mention it at the check-in and also obtain proof of ownership so that people can see I'm not involved in a commercial venture. The only thing remaining for me to do now is to speak with the airlines and to check whether or not they are happy to offer safe passage for my stone from this country to a country on the other side of the world.